The Rubbermaid Commercial HYGEN Microfiber Damp Room Mop is constructed of premium split nylon/polyester blend microfiber that provides optimal damp mopping performance. HYGEN floor microfiber mops clean 45% better than string mops and 25% better than conventional microfiber mops with a zig-zag design that packs 17% more split microfiber into each mop. 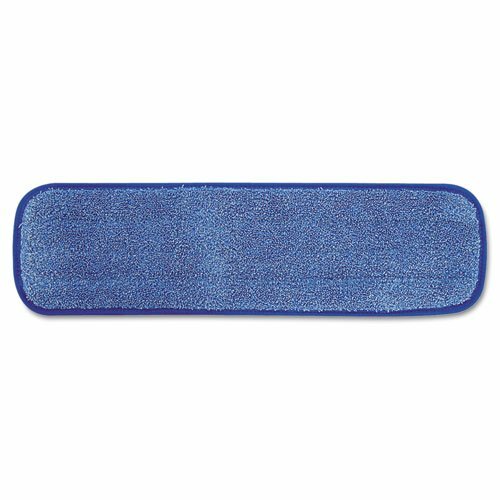 Hook-and-loop microfiber mop pads attach securely and can be easily replaced when necessary. These floor mops withstand heavy use with double-finished edges that retain their floor mop shape and can be laundered more than 500 times, 200 with bleach. These mop heads are color-coded blue for general purpose cleaning in low-risk areas. Head Type: Wet Mop Pad; Application: Floors; Mop Head Style: Microfiber Wet Room Pad; Mop Head Size: 18 1/2 x 5 1/2 x 1/2 in. Scrubbing strips for cleaning tough stains. Reduces water and chemical consumption up to 90%.